As a Canadian of a certain age (39) I must admit to a pretty good life. I grew up with a pride in multiculturalism, with a side of Eastern European bigotry. Most of my friends growing up were first generation Canadians, so when we asked what you were we didn't mean if you played hockey or soccer or worked at the convenience store, we meant what country is your family from? Mine was a suburban life, an educated one. It was not a sheltered life. I was able to ask questions, explore, and investigate. I switched to a different high school for a richer experience. I went away to University - all the way across the country to see more, do more. But it was a Canadian experience. I know the basics of US history, globalization has taught me just a little, and I rely on the stories of friends and the media to teach me more. I consider myself engaged, but I've recently realized that it is a sheltered intelligence. Last week I had the experience of 4 days in Alabama. I went there with all the preconceived notions of a visit to the Deep South - there would be grits and good ol' boys and racism and hospitality and narrow minds and nice people. I expected little in the way of enlightenment, a lot in the way of a break from my real life. I got more, so much more. We spent one day exploring downtown Birmingham. Our day took an unexpected turn when the Monday museum closures thwarted our plans for the Civil Rights Institute. 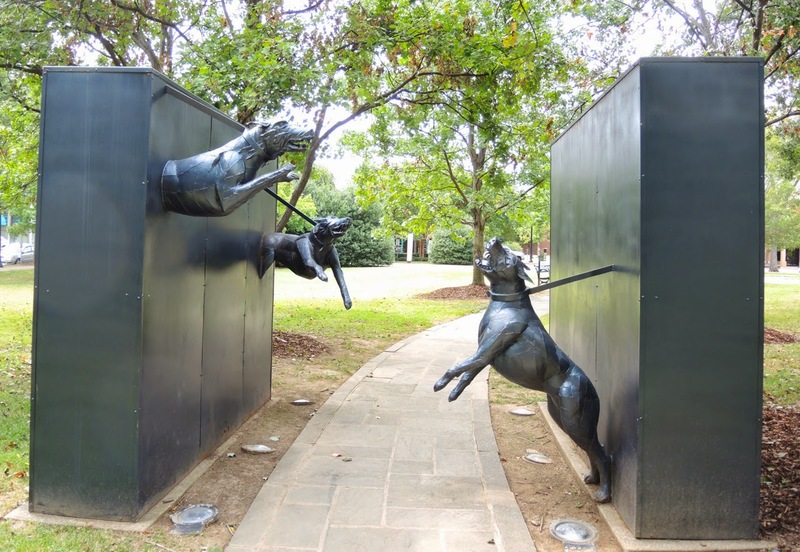 As we stood outside the doors and regrouped for our plans we were enthralled by the sculptures in the park across the street. 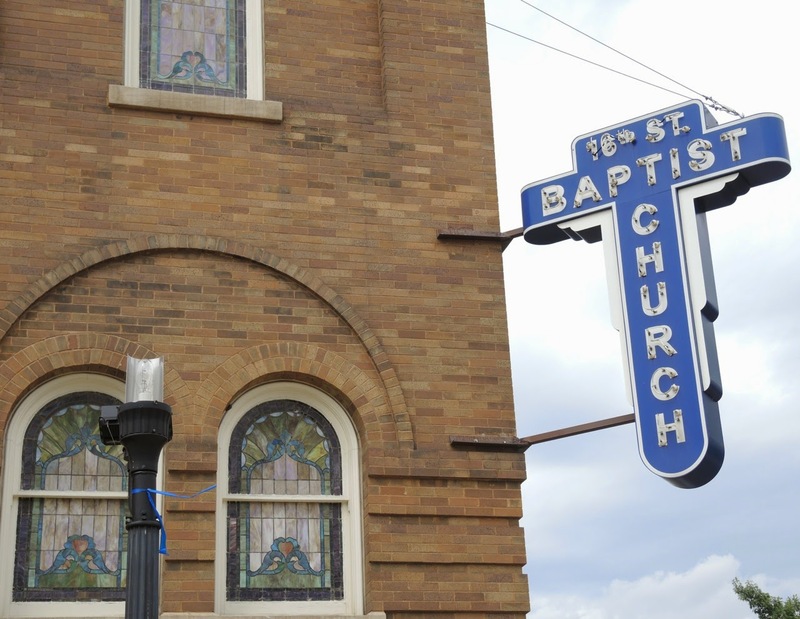 A short walk through the park and its powerful art led us across the street to the 16th Street Baptist Church. The neon sign competing with the stained glass. 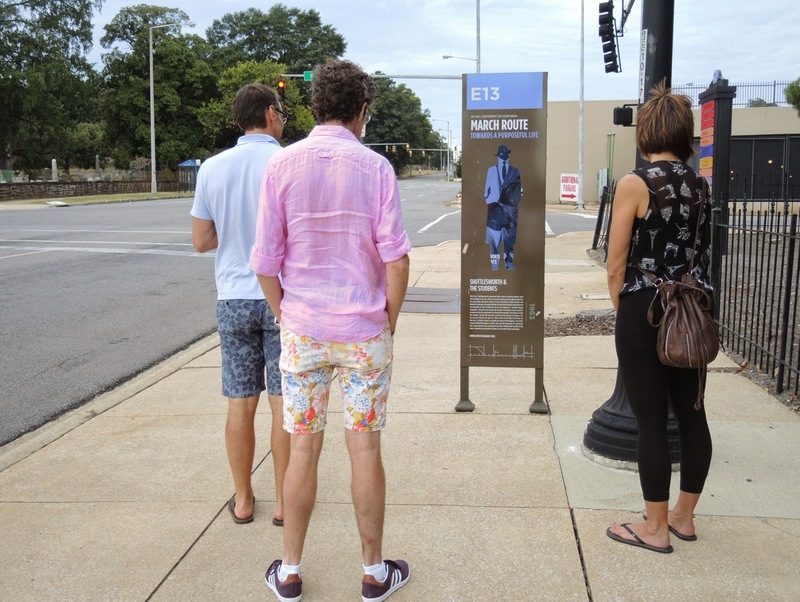 Then we embarked on the Birmingham Civil Rights Heritage Trail. Hours later we stopped, drained, and feeling a little awed. My experience with the history of the Civil Rights Movement is fixed on Martin Luther King Jr. speeches, photos of students going into desegregated schools, and a vague recollection of bus bombings. We simply aren't taught it growing up in Canada (well, I wasn't). And not because of a racism at home (although that is there) but because it wasn't our history. Here we were, honestly blown away by the stories, by the bloodshed on the streets we were standing on, the relatively recent history of this, and the fact that we simply didn't have a clue about any of it. It was humbling, enlightening, powerful. Yet while we walked the colour of our skin became an issue for others. We were called "you people" by one man. Another accused us of not giving him money as he begged on the street because he was black (not true, sir). I'll be the first to concede to a white privilege, but no one should make assumptions based on the colour of skin (and more). Those moments were equally powerful. The next day my SIL and I set out on an Alabama Road Trip to Gee's Bend. 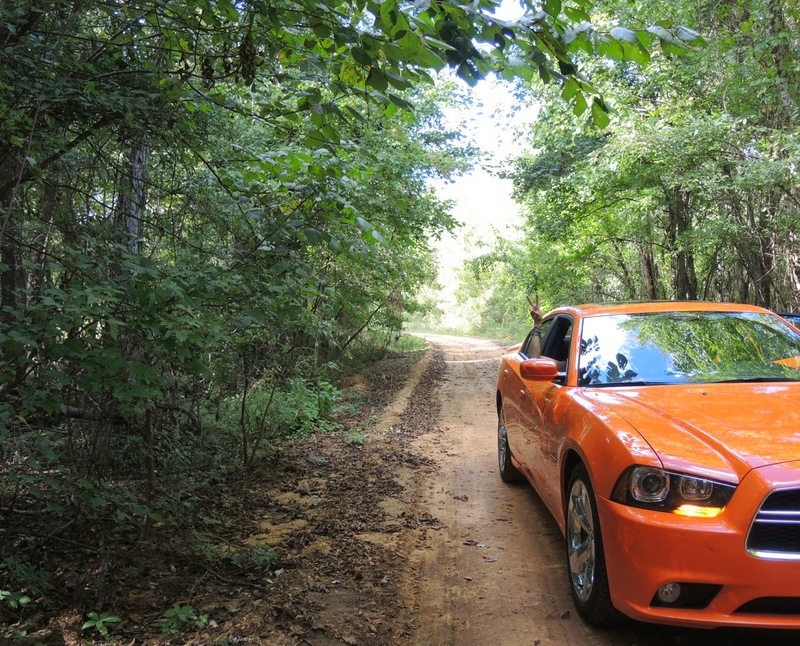 We took the scenic route, made even more scenic when we took a wrong turn or two. We found catfish farms, main streets, community gathering spots, and saw as many taxidermists as baptist churches. We eventually found our way South, through Alberta to Gee's Bend. It was a pilgrimage of sorts. THE famous Gee's Bend. 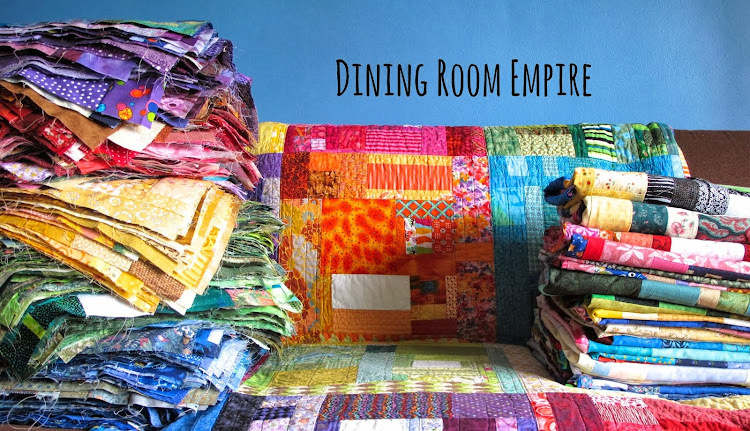 Home to the quilters that have inspired a new generation. There we were, two white women in the most ridiculous rental car to have in Alabama, and we couldn't have been more welcome. Quilters are quilters and that was the common factor. Upon arrival in Gee's Bend we went to the Ferry Terminal. As the only the only public building it seemed like the place to go. Two gorgeous women sat outside, working on one's hair weave. We started chatting to them, but before we got very far or even stated our goal for the visit another woman came out and asked if we wanted to meet the quilters. Why yes, we did. So she asked us us to follow her. 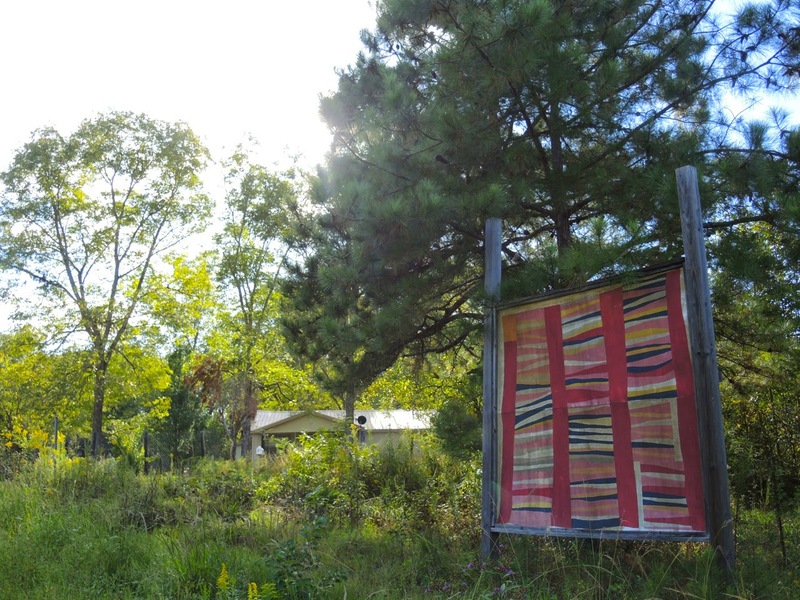 When we arrived at the Gee's Bend Quilters Collective the welcome was so warm, and not just because of the southern heat! 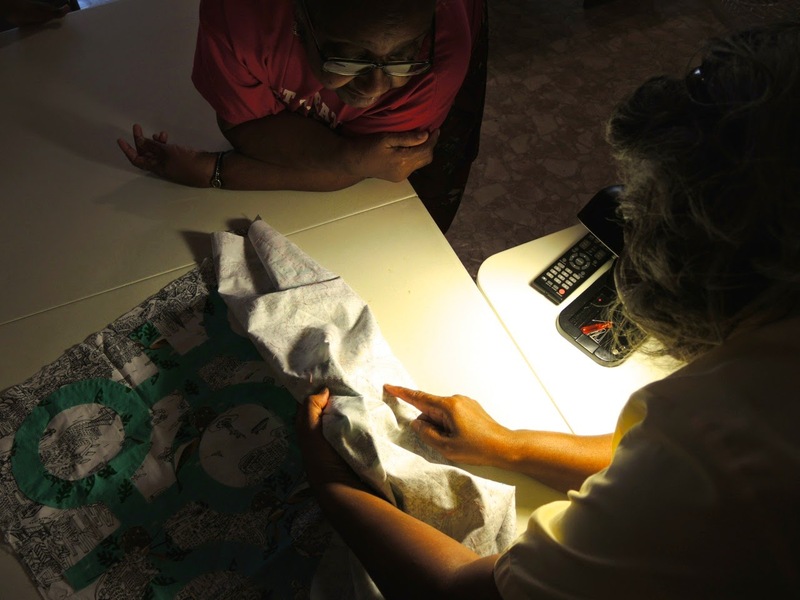 Mary Ann and China Pettway sat inside, one quilting, the other working on a brand new quilt. Immediately we started chatting and sharing work. It was late in the day for them - they were close to packing up so they could catch the afternoon ferry across the river to Camden. China had a block that looked a lot like my scrappy round and round blocks, but much, much smaller. Mary Ann was repairing some hand quilting on someone else's quilt. My intention was sit and sew with them, but our timing was poor. So they looked at my work as closely as I looked at theirs. After the fact my SIL said that I was showing off, as I brought my Circle Lattice appliqué. Yes, most definitely this project is of a very different style than the Gee's Bend work, but I disagreed with her. We looked at each other's work intently and with admiration for different styles. I was blown away by their hand stitching and tiny piecing, and they were impressed with my basting stitches and circle work. It was mutual respect. My respect for them increased four fold when we were given the chance to pull quilts off the tables and shelves to admire and hear more stories. Wow. It is always one thing to see a picture, another thing entirely to feel the quilts. There was all denim, all corduroy, all cotton, and a good dose of polyester quilts. Some were very recent - completed within the last month - and some so old they were threadbare and stained. All were made by Gee's Bend Collective Quilters. The Collective now contains about 70 or more quilters. 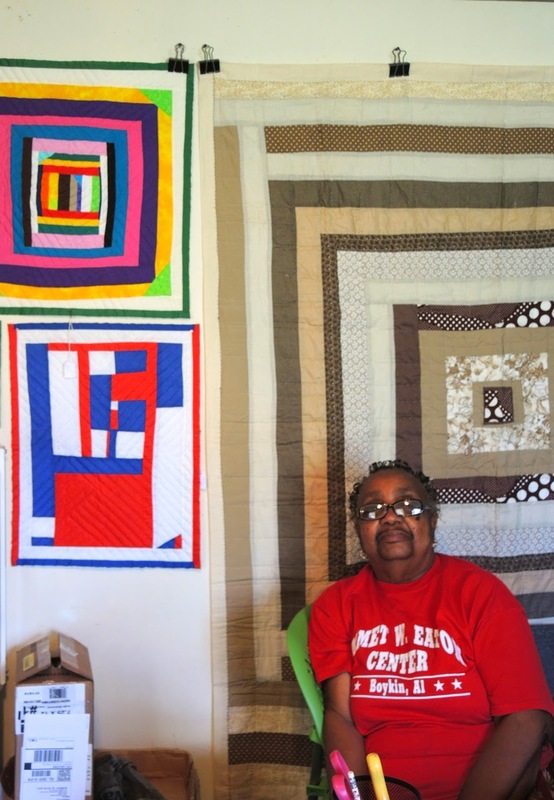 Women who came back to quilting because of the profile and success of Gee's Bend quilts, some that have been quilting for decades. 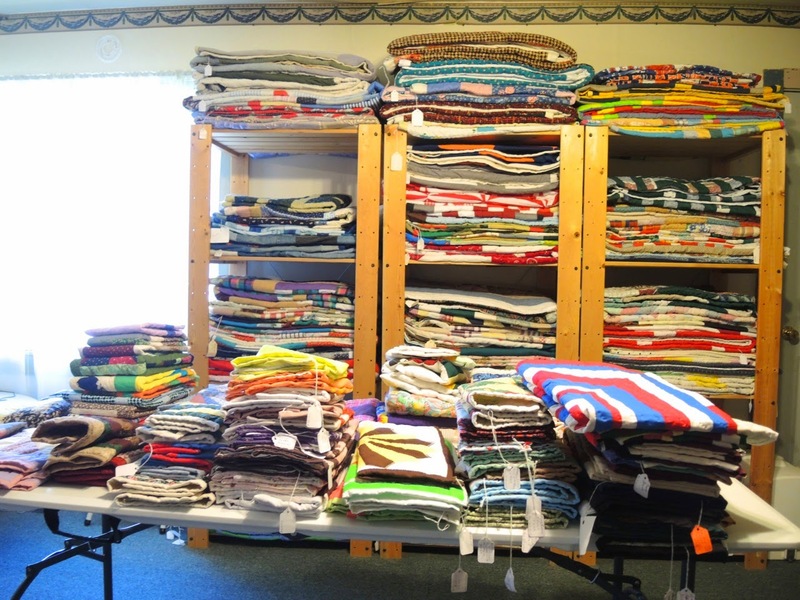 They sell their quilts, as well as potholders, mini quilts, videos, postcards, and placemats. 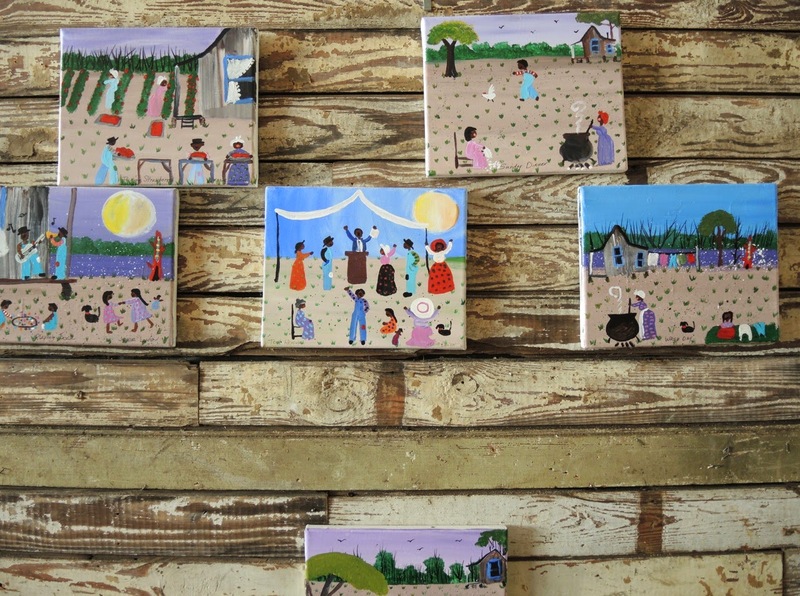 The quilter receives a percentage and the rest of the proceeds goes to the Collective. It is a financial model that helps all the quilters and the community. 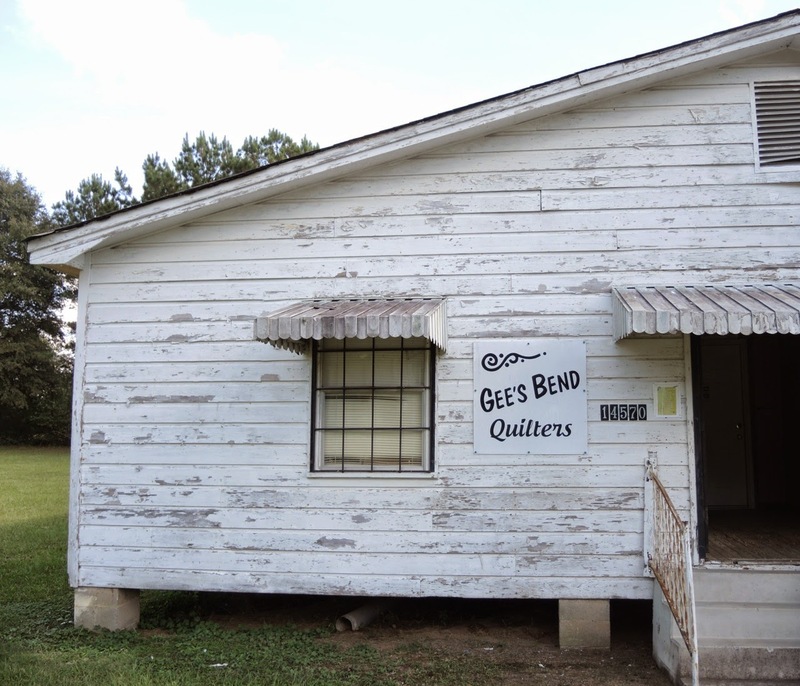 Gee's Bend is a community founded on the backs of slaves. And most of the people who live there now are descendants of slaves. During the Civil Rights movement residents were punished for their involvement in protests, bus trips, and demonstrations. 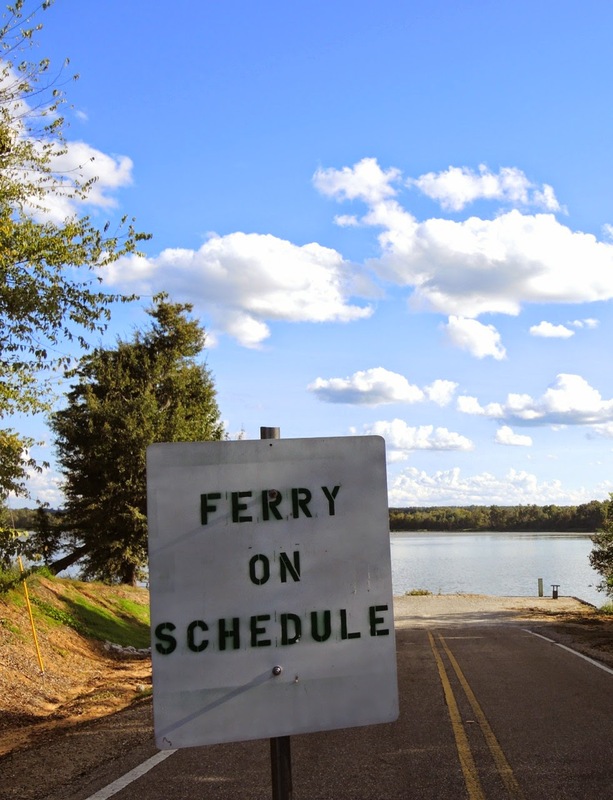 The ferry service was cut off, isolating the community even more. 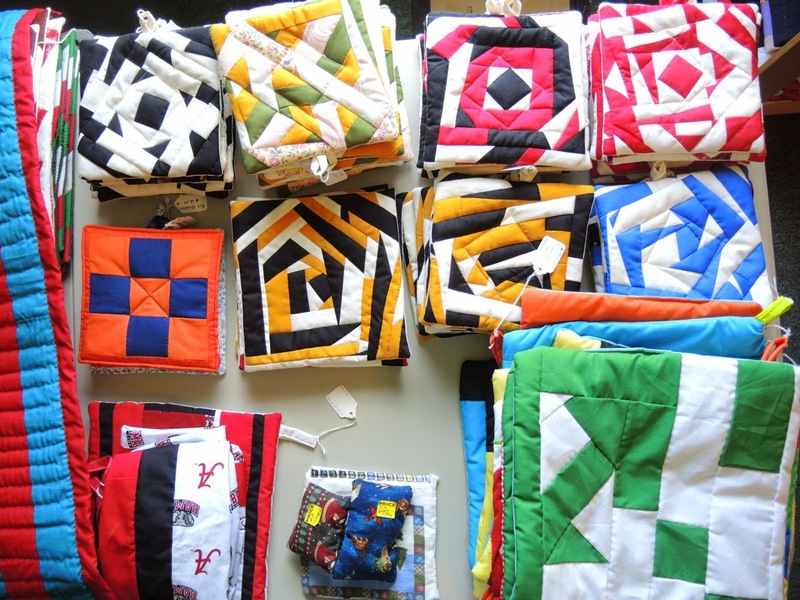 That their quilt tradition did not die is a testament to need, but to the craft even more. 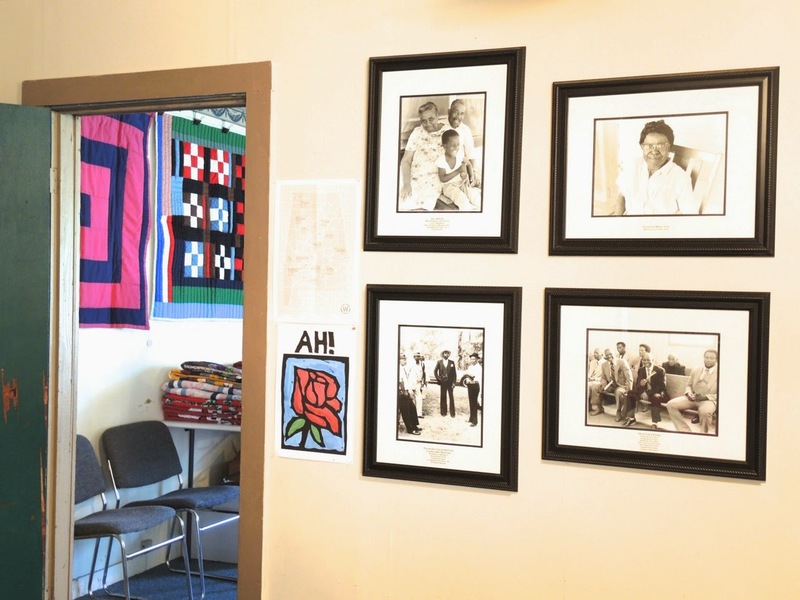 As we examined the quilts we spoke with Nancy Pettway (no relation to Mary Ann and China) about the Civil Rights Movement - she wasn't able to participate in bus trips and demonstrations because she had to work the night shift at a sewing factory - the quilts, life in Gee's Bend. I wish we had hours to talk. I'm home now and I have so many more questions, more stories I want to hear, more quilting to be done. We spoke about the Collective and the response to their fame. When you walk into the room where the quilts are stored you can sense the history. But you can also sense the future. 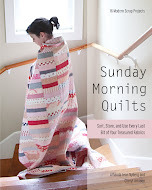 The influence on so many current and modern quilters is evident. The quilts may be machine pieced, but they are hand quilted. In fact, they had the frame for a long arm machine in the room, but they've been advised against using it in order to maintain their brand reputation. The quilts are evident of the time and place and history. They aren't squared up like I might do it. Binding techniques vary. 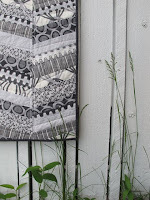 The hand quilting is lovely and provides another improvised flair to most of the quilts. There is a lot of polyester batting used. Are they the quilts I make? Nope, not at all. My SIL and I purchased some quilts. I've only ever purchased a quilt once before, as a charity fundraiser. I will totally admit to feeling odd at buying a quilt. I mean, I have dozens floating around the house and tonnes waiting to be made. But I couldn't help but be a part of this history. Another confession is that I felt that white privilege again in purchasing a quilt. Because I can afford to bring these quilts home there was a little bit of guilt. I'm not over it yet either. That being said, to know my one tiny piece of this story now, my single day experience, is profound to me. Art has its many purposes, and someone does buy the art at some point. So I can look at my small quilts and have the memory of the day, the reminder that there is so much history I've yet to learn, and the beauty of my conversations with some wonderfully kind women. As we left that day Mary Ann, China, and Nancy gave us big, deep hugs. The hugs you give people you love, the hugs that make you feel like the other person's arms are 10 feet wide and filled with warmth. When I look at my quilts that is what I will most remember. That I met some women, that we shared only a few hours, and that we are all quilters. And for us, all of us, the colour of our skin did not matter one bit. Wow - I'm tearing up. Beautifully written. I'm in Australia and my understanding of civil rights history is similar to yours. Loved your photos. You have enlightened me. A lovely essay -- thanks! Thanks for sharing such a moving story. The quilters and their quilts sound amazing, how wonderful that you were able to go to see them. Interestingly many of my friends growing up, including me were second generation Canadians, yet I am older than you. When I spend time considering human rights (most days at the office) I am reminded what a safe place, despite all our not good history, Canada is and for the most part was compared to our neighbours to the south. Thank you for the vicarious trip and uncensored emotion! Thanks for the narrative of your trip. Loved all of it! What a great end to your trip to visit the Gees Bend Quilters. Yay! Dear Cheryl, I do so love your writing style and story telling ability. Thank you for taking the time to share such a personal and profound trip with us. I grew up an hour from Dallas, Texas in the 1970's. We were going through the desegregation of schools during my high school years. I now live near DFW airport. Our area is a smorgasbord of nationalities and it's hard to realize just how racially charged some areas of our country still are. It's sad when you realize how far we still have to go to get away from color of skin prejudices. Wonderful story - very eye-opening. What a wonderful experience! I would want to spend days there too. So much history. A great story about the survival of a people. Thank you so much for sharing your story. Touching and eye-opening. ps. I've been to Montgomery, AL. And I arrived there with similar preconceived notions. It too was a wonderful experience. What an honor you had to meet with these women. They are such an inspiration. Thank you so much for sharing your story. What an amazing experience this must have been. Thanks for sharing your thoughts & beautiful pics! I remember being tremndously moved seeing their quilts at the Art Gallery of Nova Scotia and not wanting to leave. But my most favourite moment was when the Gees Be d quilters who accompanied the exhibit broke into some serious, spontaneous gospel hymns. Everyone gathered around the quilters and just listened. No one wanted them to stop singing! So glad you had such a memorable visit. What a great experience! I hope you will write even more posts with more pictures. I teared up at the part about the hugs at the end of the visit. No doubt that this was a trip that you will always carry deep within your heart and soul. I can only imagine how moving and powerful it must have been, and on so many various levels. I also found it interesting to learn that something we all know of so well, (our civil rights movement) isn't widely know everywhere... but of course, it is our history, not the worlds, and we, (the US) are not, (as much as we tend to think we are) the center of the universe! Sadly, it is something that we still haven't overcome. Prejudice and animosity, fueled by intolerance + ignorance, still run deep in most corners. Law enforcement, the judicial system and our educational resources still have a ways to go in helping to balance scales that are still woefully unbalanced. Anyone who thinks that these struggles for equality are behind us need only look towards what has been going on for the last two months in Ferguson, Missouri to see how deeply we as a nation are still struggling with these issues. Individual families also need to be the source of change, by ending the prejudices that have been passed down from generation to generation. I am blessed that my mother, who was raised in a prejudice home, broke that tradition and taught her children to think and feel differently. I am blessed that my father was able to bring Martin Luther King Jr. to speak at the college where my father worked, spreading his message that still resonates today. 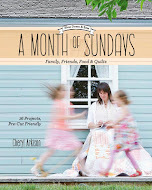 Thank you so much, Cheryl, for sharing your journey and your insights with us, beautiful post. PS. I love those paintings! Can you tell us where you found them and who did them? A wonderful post, Cheryl. I grew up in the U.S., in California, learned U.S. history, and visited Alabama as a child in the 1960s, where I remember being stunned by the posted signs "Colored Drinking Fountain" and "Colored Restroom." Even the birth and death records were divided by color. But as a white woman, I still think my awareness is cursory. I'm currently plowing through The Warmth of Other Suns, about the migration of blacks from the South to the North, and it's startled me—learning more about Jim Crow laws and the ways that they meant life for blacks in the south didn't change all that much after the abolition of slavery. And the move away from the South was fraught with similar, though sometimes more veiled, treatment—Jim Crow laws weren't in force, but job opportunities and the populace in general made it clear where blacks weren't welcome. It's a gruesome history that's still being played out daily. 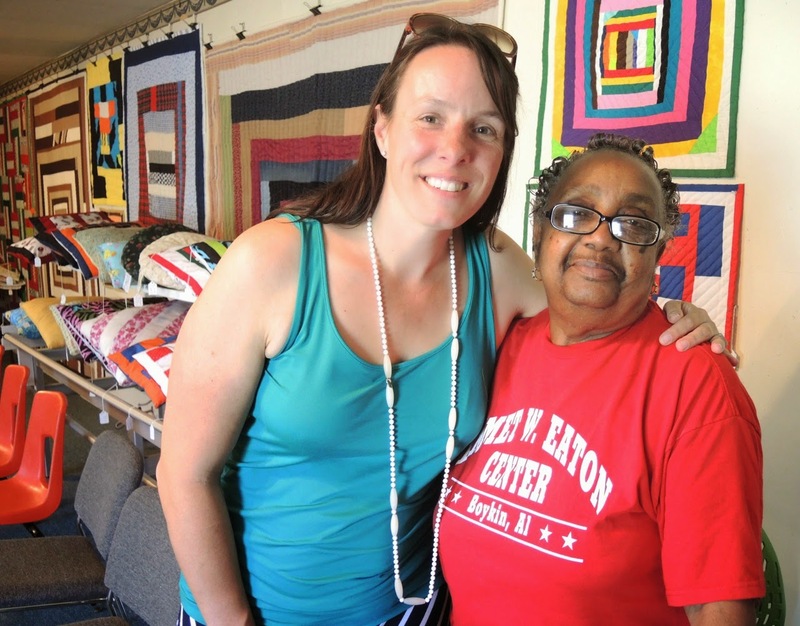 So wonderful to hear of your common ground with the Gee's Bend Quilters. How wonderful to have been to see Gees Bend and to have met those ladies there. oh Cheryl I am having a little cry now. It is simply inspiring to me to think of the community that I am a part of simply because I stitch fabric together. Thank you for sharing your amazing experience. What an amazing post of an incredible experience! So much to learn and experience... must put this on my bucket list! By using RentalCars you can get the most affordable car hire at over 49000 international locations.